From warning Pak Army chief to standing up for Kashmiris, Punjab CM Amarinder Singh did it all to gain favour among both liberals and nationalists. Since the Pulwama attack two weeks ago, Congress president Rahul Gandhi has characteristically been more or less conspicuous by his absence from the frontlines. But he could learn a lesson or two from his party colleague and Punjab Chief Minister Captain Amarinder Singh. Despite being from the opposition, Singh managed to grab the eyeballs, find a fine mix of language to gain equal favour among both the nationalists as well as the liberals. For opposition leaders grappling with the spectre of how the ruling BJP might walk away with a large chunk of popular support in a highly charged, hyper-nationalistic wave sweeping India, Singh offers a consummate political template to follow. Between 14 February, the day a Jaish-e-Mohammad suicide bomber drove his car into a convoy of vehicles carrying CRPF personnel in Kashmir’s Pulwama district, killing at least 42 security personnel, and 27 February, when an Indian Air Force pilot was captured by Pakistan, Prime Minister Narendra Modi has addressed numerous BJP rallies, inaugurated several projects, made so many speeches that one has lost count. As a result, questions have been asked if he should have continued with his game of political one-upmanship. In the midst of this BJP whirlwind, Amarinder Singh showed why he is one of the smartest politicians around, as he went about collecting huge political capital without spending much of his own and also blunting BJP’s attacks on his party – at least in Punjab. From making a passionate speech in Punjab Assembly on 15 February, in which he called for revenge by saying that time for talks with the hostile neighbour was long gone and that Pakistan had to be taught “a lesson”, to visiting BSF personnel and Army jawans at the Indo-Pak border in Dera Baba Bakala in Amritsar, and then offering to receive Wing Commander Abhinandan Varthaman at Wagah on his return from captivity in Pakistan – the Congress leader did it all and so much more. Even before the rest of the opposition could firm up its strategy, Singh was making the right – read patriotic, anti-Pakistan – noises, while at the same time reaching out to the next of kin of the CRPF personnel killed in Pulwama. He even got the Punjab Assembly to pass a resolution to contribute one month’s salary to the “families of the martyrs”. But it was his speech that did the trick. Not stopping at just the Pakistani political leadership, Amarinder decided to send out a warning to the Pakistan Army chief, too. “Let General Bajwa know. I want to say openly. You are a Punjabi and we are also Punjabi. You dare to try anything in Punjab, and we will set you right”. His speech, which went viral on social media and was shared on several WhatsApp groups, including those run by the Right-wing, was also important since it managed to completely blunt the Right-wing and Shiromani Akali Dal (Badal)’s attack on his ministerial colleague and Pakistan Prime Minister Imran Khan’s “good friend” Navjot Singh Sidhu. But, Amarinder didn’t stop at that. He spent the next few days touring border areas of Punjab, interacting with farmers and the youth, sending out a clear message to the voters that there was nothing to worry about and that “their Captain” was in complete control. On Thursday, after news came that the IAF officer would be released the next day, Amarinder used Twitter to suggest to the prime minister that since he was “touring the border areas of Punjab”, it would be “an honour for me to go and receive him (Wing Commander Abhinandan), as he and his father are alumnus of the NDA as I am”. While the offer didn’t receive any response from Modi – at least not on Twitter – it didn’t go unnoticed among others, with both the Right-wing and liberals hailing him. At the same time, the Captain also showed his strong side as an administrator. 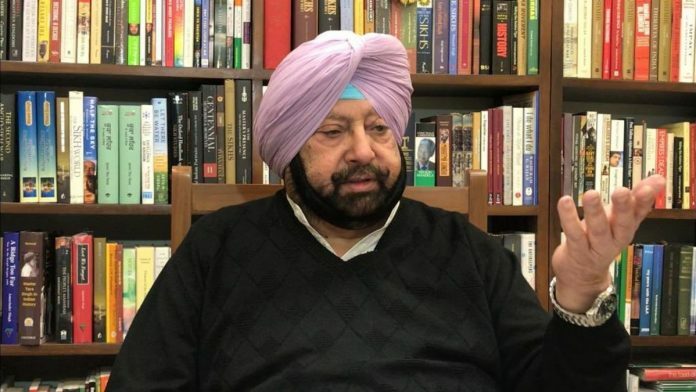 When most parts of the nation, post-Pulwama, were witnessing attacks and threats on Kashmiri students and labourers, Amarinder issued orders to his police to ensure the safety of Kashmiri students. This was when his party leadership had chosen to remain tightlipped over the attacks on Kashmiris, or, as in the case of the BJP, denied that the attacks even took place. Also read: Is Capt Amarinder Singh showing Congress the way on handling national security issues?